Caius Julius Caesar remains the most famous Roman ever to have lived. Charismatic leader of men, serial seducer of women, he was also both a brilliant politician and a military genius capable of some of the most spectacular victories in history. 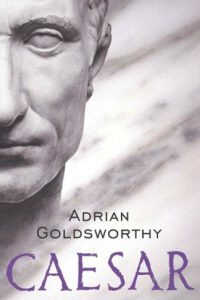 In this definitive biography, Adrian Goldsworthy places Caesar within the broad canvas of the Mediterranean world in which he lived, describing the rich but turbulent society that produced him—the politician, the general and the man. This is my first time reviewing—but not reading—nonfiction, so here goes nothing. There is a tendency to romanticize Julius Caesar, but society needs to take off those rose-coloured glasses of history. As a woman, I hate Caesar, but as someone who is fascinated by military strategies and politics in general, I love him. Adrian Goldsworthy provides a thorough, incredibly detailed account of Caesar’s public and private lives, showing him as the [insert creative expletive here] he was at times as well as showing why his speeches, battle tactics and writings are still studied today. Caesar did quite a lot in his relatively short life (as compared to today’s life expectancies, anyway), so this biography is well over 600 pages. However, you will not be bored because Adrian Goldsworthy has a very engaging writing style. He is able to keep the events moving along while providing enormous amounts of information on his subject and adding in background information so readers will be able to take Caesar’s actions in context. If you’re interested in learning about Julius Caesar, this is the only book you’ll ever need. Well, that’s not entirely true. After reading Caesar, you’ll want to rush out and buy a copy of Caesar’s famous commentaries on the Gallic War and the British campaign as well as his commentaries on the civil war he fought with Gnaeus Pompeius Magnus (Pompey the Great) to get a better feel of the man. But other than that, I consider this pretty much the definitive work on his life and would highly recommend it.